I can't believe it's week #10 of my seashell game already! I posted my first seashell photo on the second day of this blog, so I know my blog is also into week ten. Amazing, I've met so many wonderful bloggers and have had such fun, the time has just flown by. For those who may not have been here before, this competition has a giveaway to the person who gets the most right answers first in twelve weeks. The winner gets to choose the mousepad of their choice from my Zazzle store and I have a few new ones that will be added in the next few weeks. Previously I have always posted the photo at a random time each Sunday. After a little input from a few folks playing along, I've decided I will be hitting "publish" at precisely 2:00 pm EST every Sunday. It is an Atlantic turkey wing, I think. I have one in a collection on my coffee table. I saw that someone had visited my blog from yours so I stopped by. Thank you for listing me as one of your artsy favorites! Your Zazzle shop is great. I just started one and am going to promote its grand opening this week. See you around the beach. Hi All Y'all, thanks for stopping in today. I had to get some yard work done today, so I'm just checking in and I see that Pam got it right first again! Congrats Pam! Chris, I love the vintage shell engraving you sent the link for — very cool, don't you just love NYPL archives? 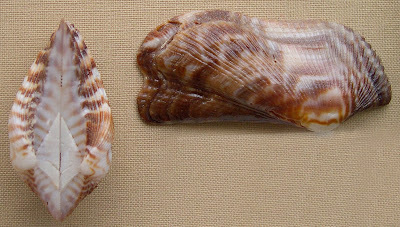 Your shell would be in the Arcidae Family, the species found in Florida is Arca zebra. Does your have stripes like the one here? Yes Sue, your right also. They are an interesting addition to shell collections and as you know very common here in Florida. Suzanne, I'm so excited you dropped in, I love your art and you're a displaced Cali Gal living in Georgia! I'm going now to leave a comment on your blog. Can't wait to see your Zazzle store, I know it will be amazing! My knowledge is very limited on shells so following your game will be a learning experience for me.. I'm glad you will be following and that you're interested in learning the names of all these gorgeous shells, that was one of the reasons I decided to start the game. I meet tourists on the beach here inn Florida and they always enjoy knowing the names of what they're packing in their suitcase to take home. This one was a newbie for me..., never seen before. Interesting. I love the sea shells. Aww, so pretty! I have always enjoyed learning new sea shell names. Thanks!